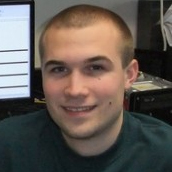 Andrew Shamp, a CDAC graduate student in the research group of Academic Partner Eva Zurek at the University at Buffalo, has been awarded an NNSA Graduate Fellowship. He will be completing his PhD studies this month and will take up his new position in January 2017. During his graduate work, Andrew has carried out electronic structure calculations using density functional theory and first-principles molecular dynamics simulations on materials at ultrahigh pressures, including work on systems at conditions relevant to laser shock compression. In his new position, he will be joining the NNSA office in Washington, DC where he will working in Defense Programs Research and Development (NA-113). NA-113 oversees research and development activities within the NA-11 Office of Research, Development, Test and Evaluation to ensure the safety, security, and reliability of the nuclear weapons stockpile through scientific research and advantageous international collaborations. This mission is accomplished through cooperation with the NNSA labs (Sandia, Lawrence Livermore, Los Alamos) with leading edge, experimental, and computational capabilities. Congratulations and all best wishes from the CDAC community to Andrew as he begins a new chapter in his career!